Giving myself a manicure is a weekly must for me, I like my nails to look neat and clean and most of all – shiny!! I’m not a massive wearer of coloured nail polish on my fingernails (toe nails are a different story – I have to have them painted!) but I always have a clear coat of nail polish on. Here are the steps I take when I’m giving myself a manicure at home! I usually do this after a shower or bath because your nails are softest after being in the water! I’ll take a few cotton tail cotton pads to remove my nail polish along with Cutex Ultra Cleansing Nail polish remover which I have went through countless bottles of because it my favourite! I then take my Leighton Denny Glass Nail File and file my nails, making sure to only file in one direction so as not to cause breakages! I love glass nails files so much, they make the edge of the nail so smooth and file so quickly! They are a bit dearer than standard files or emery boards but so worth it! I then use Sally Hansen Instant Cuticle Remover and put a small amount around each cuticle, leave for 15 seconds then push the cuticles back with my new Leighton Denny Hoof Stick, I was using wooden orange sticks before this but I far prefer the Leighton Denny one! After rinsing this off, I then take my favourite clear coat which is OPI Nail Envy. This stuff makes my nails so shiny and doesn’t flake or peel off like other clear polishes I’ve tried in the past. I couldn’t be without this stuff now, I usually buy mine from Ebay as its much cheaper, just make sure you get a genuine one from a top rated seller! 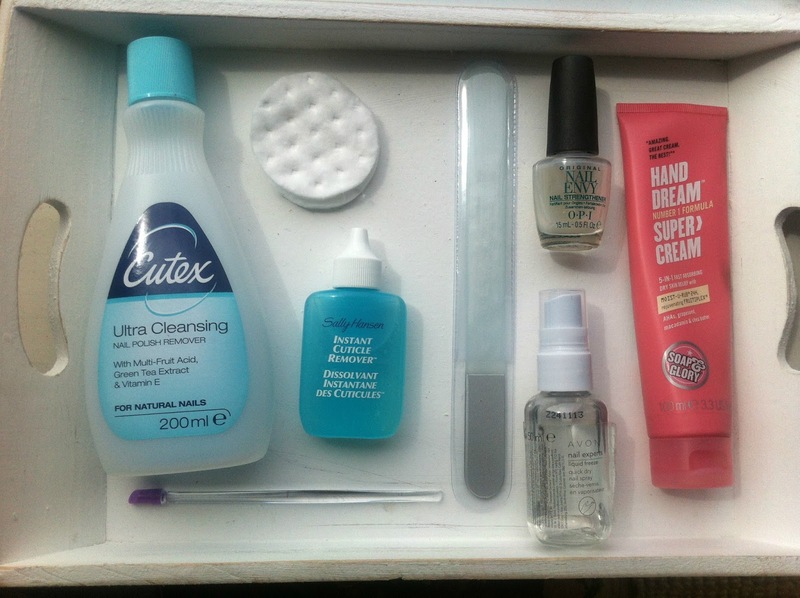 What are your manicure essentials? I'm a manicure addict. Sometimes I change my polish a couple times a week! I've always loved giving myself manicures. Its such a calming thing to do. I also really love the O.P.I top coat! I must try using a glass file, my nails would sooo thank me! I just love your blog !!! If you use nail polish remover after the cuticle remover and before the polish your nail polish will last longer :) It gives the polish a dry surface so it adheres better. I am so bad at painting my nails, yet I love wearing colours. I love Sally Hansen`s top coats and treatments, they are so good. That's plenty of products for manicure. Love that shade of nail polish! Every women must have love it! I blog about jewelry and how to style them with outfits. I love the soap and glory hand cream too! We love how great manicured nails look and feel, it's especially important to only file in one direction like you mentioned, thanks for sharing with us. Thank you for commenting! I read them all and reply/visit your blog when I can! © Danielle's Beauty Blog | All rights reserved.